A Smart Home is a comfort zone. The lights come on automatically, the door unlocks as soon as an occupant approaches the building. Prior to this, the HVAG system has set the radiators to a comfortable temperature. The letterbox sends a text message when the mail arrives; the washing machine uses the cheapest electricity rates, if electricity has to be paid for at all, as the Smart Building is energy self-sufficient. It knows its occupants' habits and makes their lives as convenient as possible. Even Smart Cities can be created, just by linking these extremely smart buildings. Science Fiction? Not at all. BAU 2017 shows how far digital technology has as yet advanced. In wintertime, when Julia König returns home after a long day at work, everything has been prepared: the apartment is nice and warm, the lights have been switched on in the hallway and the living room, and the blinds are already down. All relaxed she drops into her favourite armchair and looks forward to the evening ahead. When the young doctor leaves the house in the morning, the heating system automatically reduces the temperature, the security system is activated and all devices unnecessarily consuming electricity are being switched off. There is no doubt: the smart home makes people's lives easier as it relies on intelligent building technology. What has been a “toy for techies” a few years ago has become reality today. Interconnectivity starts with simple sensors, switches and lights, and can lead to various living room scenarios—including the control of temperature, brightness, movement, door and window contacts, household appliances, communication technology, and entertainment electronics. In the case of a fire, smoke detectors save lives; motion sensors detect suspicious activity in the dark, whilst they have a deterrence effect; and alarm systems protect the house from burglars. From afar you can check whether the stove and the washing machine are off, and the gate is shut. Almost weekly, new applications are launched into the market. Smart homes thus become increasingly interesting for homeowners and tenants. Another reason is the level of comfort provided to the elderly. Experts already call it a smart home boom. This is primarily due to one driver: the Smartphone. Since almost all users have an operating system in their pocket that can control more and more applications of the building technology in a very simple way. Apps are connected via Bluetooth Smartphone and Wi-Fi, or remotely via a mobile phone connection. Hence, the market gets moving, as home automation system providers are finding new solutions in various communication protocols (radio and bus systems). They join up to facilitate more complex control options by combining individual solutions, and to further optimize the use of Smart Home applications. Beyond merely managing heating, lighting and the home's security system these state of the art smart home applications offer far more. The latest developments even enable the connection of building components, such as glazing, doors, and windows; and turn them into intelligent systems that enhance the living comfort and energy efficiency of buildings. One result could be, for instance, an intelligent facade. It converts smart homes into smart buildings. Smart energy management, shading control, security systems and monitoring functions, as well as real-time monitoring of all consumption and fabrication data of the building pave the way to intelligent and future oriented building construction. When this concept is rolled out from the individual building to an entire district, we get a Smart City. Schneider Electric's prototype on the Euref-Campus in Berlin demonstrates what a Smart City could look like. Zeemo Base is a power house that adds a solar base-load power station to the emission-neutral district. It provides for example the conditions to fuel cars with electricity from renewable energy sources. The use of storage media can guarantee reliable electric power supply for the entire district. Furthermore, it features a block heating station on the campus, and a connection to the public power grid. Pilot projects in Weinsberg near Heilbronn, and the Gelbe Viertel in Berlin demonstrate the synergy between solar power, joint batteries, and a preferably high internal consumption. It shows an intelligent comprehensive solution which benefits the environment and the wallet, and which can serve as a role-model for other energy supply programs for tenants. The interconnected home faces a bright future. More and more smart home technologies are ready to be applied. Over the next few years they will have a major impact on our lives. At BAU 2017 in Munich, every two years the place to meet for everybody in the construction industry, you will be able to see the most significant novelties in this field. Leading brands of high quality building equipment, such as Gira, Dornbracht, Revox, Miele and Vaillant have joined up under the name Connected Comfort to make real estate smarter across all trades. The result: quality of life and living comfort on the highest level. In addition to multi-room audio solutions, Revox’s hi-fi experts also offer an individual control system and music selection for multiple users. Using the audio system “Voxnet” and an app, all home occupants can access their own music library and play it in the “assigned” rooms. GEZE banks on the new interface module “IQ box KNX” to monitor and control building automation systems. It facilitates natural ventilation by means of the GEZE window drives. In order to monitor air quality, rain and wind, as well as security status it can also be connected to sensors. Within the scope of their “Basic” design line Siedle offers the new video indoor station, and enables thus an affordable, simple way of video intercommunication. Siedle promises excellent video and audio quality, as well as easy operating and installation. 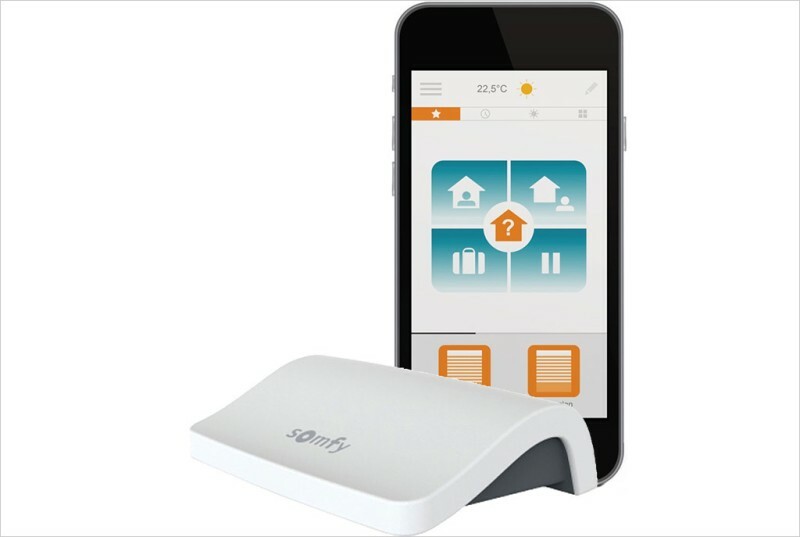 A rather simple entry into the world of smart living is provided by Somfy. 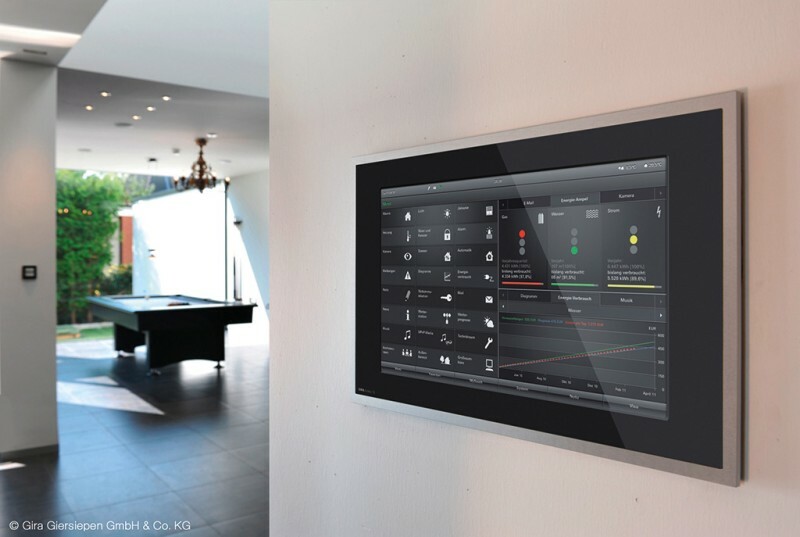 By means of your Smartphone app the control system “Connexoon” allows you to control three different areas from home or elsewhere: windows, terrace and house entry. Once occupants leave the house, all products move to their set position, whilst the automatic sun protection and timer are activated. Upon their return Geofencing opens the garage door and the lights come on. Conclusion: The “smart home”—an intelligent house that enhances living comfort and saves costs—is no longer a vision, but it has become reality. The required technology is already available. It can be seen at BAU 2017 in Munich. 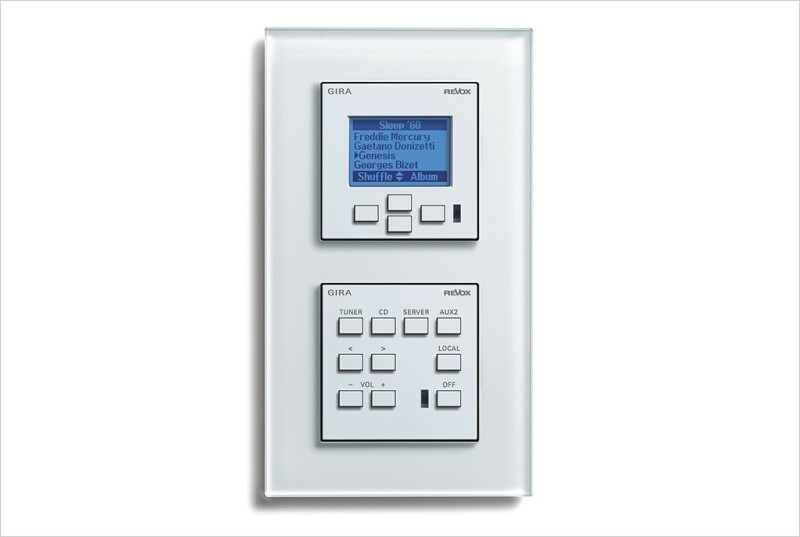 The Gira KNX System is an intelligent concept for the linking and controlling of building technology. It increases the home comfort and ensures at the same time more security and lower energy costs. With Somfy Connexoon different areas of the house can be controlled via apps. Individual music in different rooms: The Gira control unit for the Revox Multiroom System.